My favorite part of the cover of this book is the spine; it's pink and it has silver polka dots along the sides. The cover itself is really cute, too. I like the flowy image that floats on the cover. It looks like magic! I think it looks really nice next to the cover of the sequel, Shadowspell. First, I'd like to point out that Dana knows her Fae heritage. In most (maybe even all) of the other YA faerie books I've read, it's a surprise to the protagonist. I felt like this was a nice change. The story flowed very nicely and was quick paced. I could not put this book down! At first, I was not thrilled by the fact that Avalon is full of faeries and humans and that people know about the fae. But, I quickly got over that and decided that this fact makes the story different and more exciting. 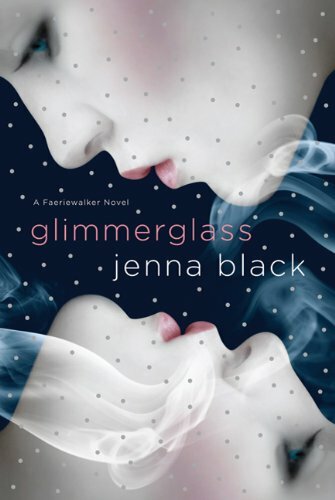 Glimmerglass is a different type of faerie novel and I truly can't wait until January 4th, when Shadowspell is released. Hi, there! I'm a new follower, and would like to say, first of all, that I LOVE the design of your blog!! It's absolutely BEAUTIFUL!! I love the design of this book and it really was good. The sequel is out, but I haven't gotten it yet. Definitely check this one out if you like faerie novels.